" 2 arrows would appear to the right and hitting the upper arrow would bring all of my bookmark folders allowing me the choice of which folder I wanted to save the new bookmark to." Do you get this drop down? While I do get the drop down menu when I hit the right upper arrow, I only get the following choices: Bookmarks Toolbar, Bookmarks Menu or Other Bookmarks when I hit the upper arrow to the right instead of being able to save a bookmark to a folder of my choice as I used to be able to do. Can't figure out why. 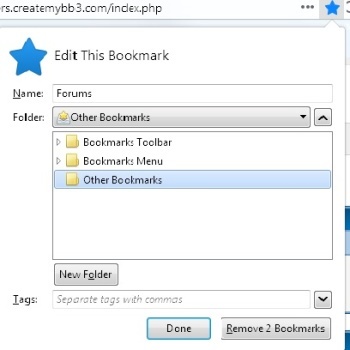 Bookmarks Toolbar & Bookmarks Menu? Click each ">" to open the respective folders. 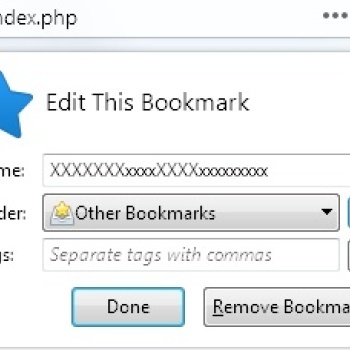 There is not one ">" for the "Other Bookmarks." LIMPET235: thanks for pointing out that there is not a small ">" right pointing "arrow" for the "Other Bookmarks". My issue is finally resolved and I can once again save a Topic to the folder of my choice. Really appreciate your patience/help in resolving my problem. If you use any of the hosting sites, choose the bbcode link & that will post the image here. Just keep the images to a reasonably small/ish size. Say 600 x 500 or so.